Klein makes a lot of different models when it comes to Diagonal Cutting Pliers and Wylaco stocks them! Klein Tools D2000-28-INS 8" Insulated High-Leverage Diagonal-Cutting Pliers Klein Tools, Inc. represents much more than Klein pliers. The company's product line has broadened to include virtually every major type of hand tool used in construction, electronics, mining, and general industry in addition to the electrical and telecommunications fields. Klein T..
Klein Tools D248-8-INS 8" Insulated High-Leverage Diagonal-Cutting Pliers - Angled Head Klein Tools, Inc. represents much more than Klein pliers. The company's product line has broadened to include virtually every major type of hand tool used in construction, electronics, mining, and general industry in addition to the electrical and telecommunications fields. &nbs..
Klein D202-5 Specifications: • Cutting Knives: standard • Handle Color: Red • Handle Finish: plastic-dipped • Jaw Length: 13/16" • Jaw Thickness: 7/16" • Jaw Width: 11/16" • Overall Length: 5-9/16" Klein D202-5 Features: • &n.. Custom US-made tool steel. Induction hardened cutting knives for long life. Hot-riveted joint ensures smooth action and no handle wobble. Short jaws and beveled cutting edges permit close cutting of wire. 2000 Series pliers available. Cuts ACSR, screws, nails, and most hardened wire. Plastic-dipped handles for comfort and ease of identification. Cleanly strips..
Klein D209-4C Electronics Midget Diagonal-Cutting Pliers-4"
Custom US-made tool steel. Induction hardened cutting knives for long life. Hot-riveted joint ensures smooth action and no handle wobble. Short jaws and beveled cutting edges permit close cutting of wire. 2000 Series pliers available. Cuts ACSR, screws, nails, and most hardened wire. Plastic-dipped handles for comfort and ease of identification. Sharp pointed-..
Klein D209-5C Electronics Midget Diagonal-Cutting Pliers-5"
Klein D220-7 Diag.-Cutting Pliers, HD, Tapered Nose, 7-11/16" Heavy-duty tapered nose design. One-inch jaws easily reach into confined spaces. Klein D220-7 Specifications Cutting Knives- standard Handle Color- red Handle Finish- plastic-dipped Jaw Length- 1" Jaw Length Metric- 25 mm Jaw Thickness- 1/2" Jaw Thickness Metric- 13 mm .. The Klein Tools 5 in. Electrician's Diagonal-Cutting Pliers cut on an angle and offer short jaws with beveled edges to easily accommodate work in confined spaces. 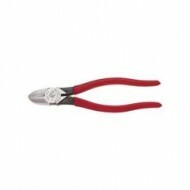 These pliers resist wobbling with a hot-riveted joint and ensure a secure grip with cross-hatched knurled jaws. Steel construction Narrow jaw and hinge allow for work in tight spaces Sharp pointed-nos..
Klein Tool D257-4 is a 4-3/16 Inch Electronics Midget Standard Diagonal Cutting Pliers. Tapered nose for easy working in confined areas and close tip cutting. Klein D257-4 Cutting Pliers Features: Heavier design for all-purpose use. Tapered nose for easy working in confined areas. Bell System Type "W" notches - Slit insulation cleanly. Klei..
Klein D259-4C Specifications: • Cutting Type: Flush • Handle Color: royal blue • Handle Finish: plastic-dipped • Jaw Length: 1/2" • Jaw Thickness: 1/4" • Jaw Width: 13/32" • Overall Length: 4-1/4" Klein D259-4C Features: • Narrow jaw and hing..
Klein Tool D295-4C is a 4 Inch Midget Tapered-Nose, Midget Jaw Diagonal Cutting Pliers. Miniature jaw for close-quarter work with maximum visibility. Klein D295-4C Cutting Pliers Features: Sharp pointed-nose for precise tip cutting. Spring-loaded action for self-opening. Klein Tool D295-4C Specifications Cutting Knives: flush Handl..
Klein Diagonal Cutting Pliers Tapered Nose, 6"
Features: "W" stripping notch Pliers halves are matched side to side, jaw to jaw, and hot riveted Precision machined, mating surfaces and design dimensions, to extremely close tolerances Tapered nose "V" notch for crushing insulation Standard-bevel cutting knives Drop forged, hardened, and tempered construction Overall Length : 5 1/2 in ..
Klein Tools, Inc. 8 In. Journeyman High-Leverage Diagonal-Cutting Pliers Angled Head Angled head design for easy work in confined spaces. High-leverage design. Rivet is closer to the cutting edge for 36% greater cutting and gripping power than other plier designs. Short jaws and beveled cutting edges permit close cutting of wire. Induction-hardened cutting kniv..
High-leverage design Rivet is closer to the cutting edge for 36% greater cutting power than other pliers design Red plastic-dipped handles Standard cutting knives 7/16" jaw thickness High leverage design provides greater mechanical cutting and gripping. Heavy duty. Standard bevel cutting knives. Plastic dipped handles. 8'' hand formed handle style. ..
Klein D2000-28 Specifications: Cutting Knives: standard Handle Color: royal blue Handle Finish : plastic-dipped Jaw Length : 13/16" Jaw Thickness: 7/16" Jaw Width : 1-3/16" Overall Length: 8-1/16" Klein D2000-28 Features: High-leverage design. Rivet is closer to the cutting edge for 36% greater ..
Klein D238-8 Specifications: • Cutting Knives: semi-flush • Handle Color: red • Handle Finish : plastic-dipped • Jaw Length: 13/16" • Jaw Thickness : 7/16" • Jaw Width: 1-3/16" • Overall Length : 8-1/16" Klein D238-8 Features: • Angled head design for easy work in confined spaces. • High-leverag..
Klein D248-8 Specifications: • Cutting Knives: Standard • Handle Color : Red • Handle Finish : plastic-dipped • Jaw Length: 13/16" • Jaw Thickness: 7/16" • Jaw Width: 1-3/16" • Overall Length: 8-1/16" Klein D248-8 Features: • Angled head design for easy work in confined spaces. • High-leverage design. Rivet..
Klein D248-9ST Specifications: • Cutting Knives : standard • Handle Color: Red • Handle Finish: plastic-dipped • Jaw Length: 13/16" • Jaw Thickness: 7/16" • Jaw Width: 1-3/16" • Overall Length: 9-3/16" Klein D248-9ST Features: • Angled head design for easy work in confined spaces. • Hooked handle for ..
Klein J2000-28 Specifications: • Cutting Knives: standard • Handle Color:light-blue/black • Handle Finish: Journeyman • Jaw Length: 13/16" • Jaw Thickness: 7/16" • Jaw Width: 1-3/16" • Overall Length: 8-1/8" Klein J2000-28 Features: • 2..
Klein J2288 Specifications: • Cutting Knives: standard • Handle Color: red/black • Handle Finish: Journeyman • Jaw Length: 13/16" • Jaw Thickness: 7/16" • Jaw Width: 1-3/16" • Overall Length: 8-1/8" Klein J2288 Features: • High-leverage design. Rivet is closer to the cutting edge for 36% greater cuttin..